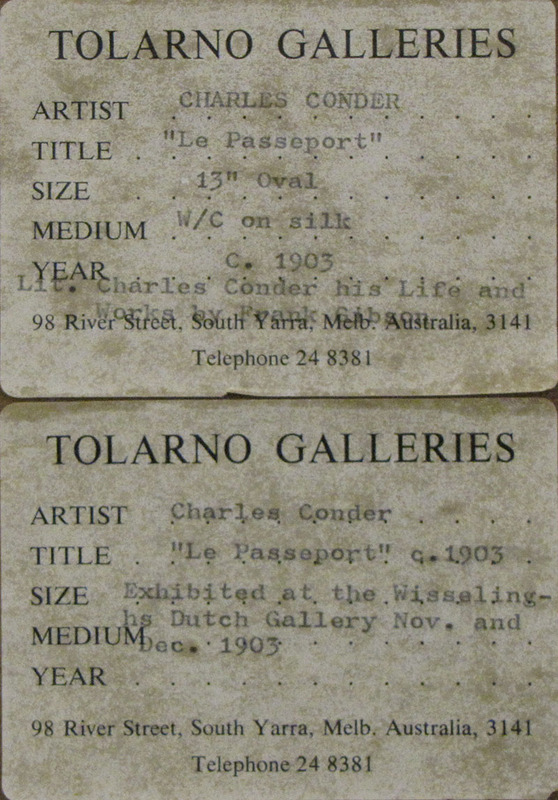 Charles Edward Conder (1868-1909), painter, lithographer and fan-designer, was born in London, his father subsequently sent him to NSW arriving 1884, to work under his uncle, William Jacomb Conder, where he was employed in the office of the Lands Department. From October 1888 to April 1890 Conder settled in Melbourne; there he first shared a studio with Roberts. Together with Arthur Streeton, Roberts and other painters he spent the summers of 1888-89 and 1889-90 at the Eaglemont 'camp' near Heidelberg. Conder played a memorable part in the growth of the first Australian school of open-air painting, in the exhibition of 9 x 5 impressions at Buxton Galleries, Swanston Street, on 17 August 1889 for which he designed the invitation and exhibiting some 47 works, also contributed to the exhibitions of the Victorian Artists' Society of November 1888, May 1889 and March 1890. He returned 1890 to Paris and London, studying at Cormon’s atelier and where he mixed with literary and artistic identities including the likes of Oscar Wilde, Audrey Beardsley, Whistler and Henri de Toulouse-Lautrec. 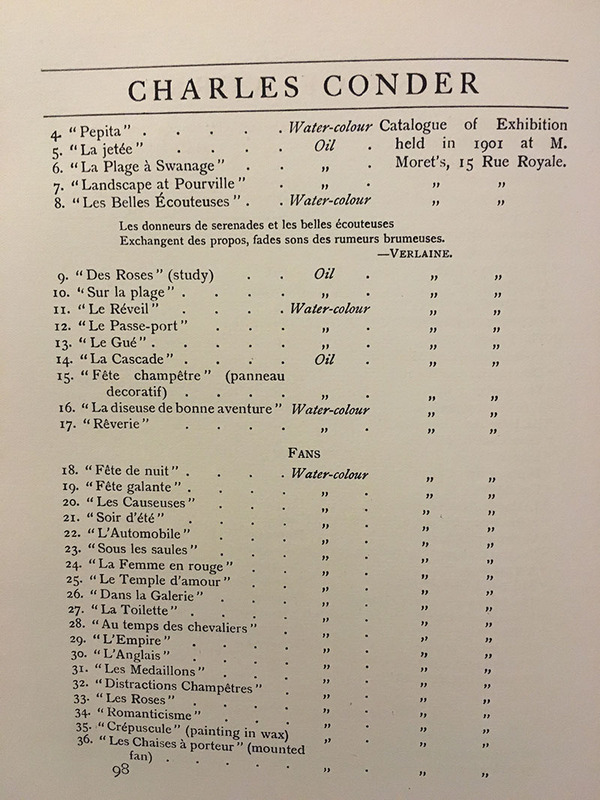 He took up residence in London in 1894 but made frequent journeys to Normandy and Dieppe. 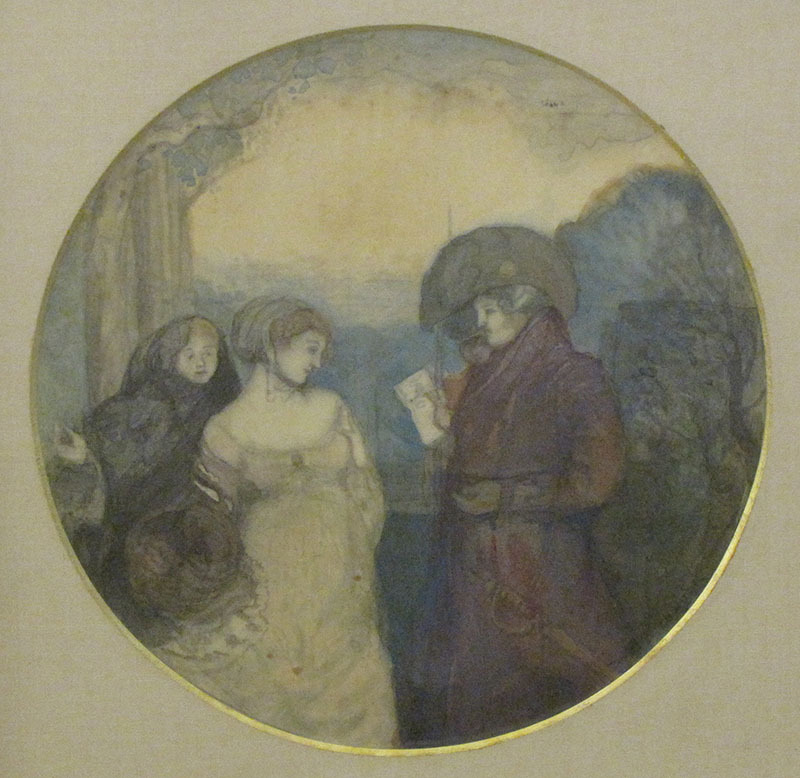 After 1895 he became increasingly preoccupied with fan designs and working in water-colour on silk which laid the foundations of his fame, and was encouraged by William Rothenstein to make lithographs. 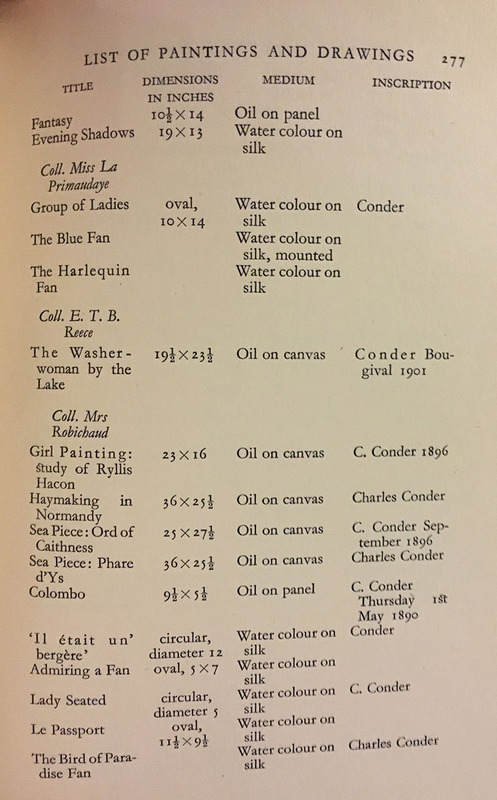 In 1900 Conder married Stella Maris Belford, and for the next six years led a socially graceful life, however after 1907 frequently confined to a sanatorium, and died 1909, Surrey. 1901 at M.Moret’s, 15 Rue Royale, Paris cat no 12 (Ref Frank Gibson Charles Condor His Life & Works, Bodley Head Press London 1914 p.98) Label on verso notes ‘Exhibited at the Wisseling-hs Dutch Gallery Nov. & Dec. 1903; The work is further listed ‘Collection Mrs Robichaud’ (Ref John Rothenstein The Life & Death of Condor, Dent London 1938 p.277); Tolarno Galleries, South Yarra, Melbourne stickers on verso. It was purchased from Leonard Joel Auctions c1970, hence to collection of a private gentleman.